Feng Shui in essence is how we experience architecture and the built-environment in a particular way and this “particular” way has its root in Chinese culture. The best way to express this Chinese perspective is written up in Laozi’s Daode Jing: “Molding clay into a vessel, we find the utility in its hollowness; cutting doors and windows for a house, we find the utility in its empty space. There for the being of things is profitable, the non-being of things is serviceable.” (trans. by David Hall and Roger T. Ames 1998) To the Chinese, what make a building or space useful are not the solid walls but the void space enclosed by the walls and one needs at least three sides to do this effectively. In Feng Shui, the term “Juqi” or “Assembled Qi” is used to express this desirable quality and the “Siling” or the “Four Mythical Animals” model in Form School Feng Shui is a good example. The black Turtle at the back should be protective and higher than the other three animals, the Azure Dragon to the left should be more vigorous than the White Tiger to the right, the two echo each other to gather the qi of the land in the middle, with the Red Bird in front being the lowest open space to form the Mingtang (the Bright Hall) in front of the Xue or the Feng Shui Spot. 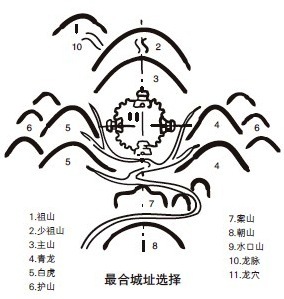 This ideal Feng Shui model is used to selection a site for a city, a town, a village, and in urban planning (e.g. 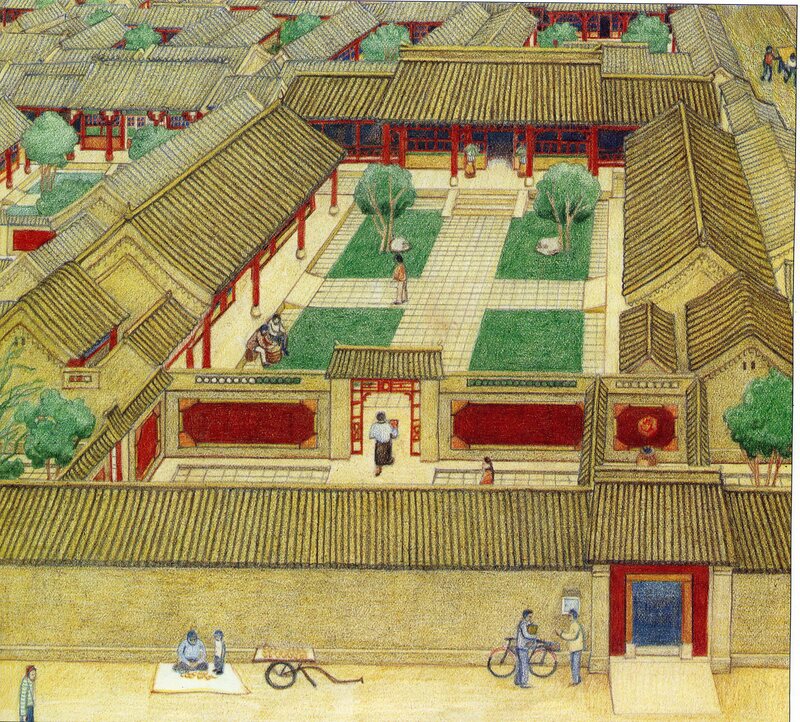 The Forbidden City) and house design (e.g. the traditional courtyard house) as well interior furniture layout like the living room. The ideal city model embraced by the four mythical animals. A typical traditional courtyard house. 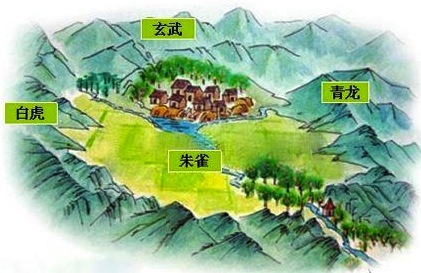 The parents stay in the Black Turtle sector, the male children to the Azure Dragon side and the female memebrs to the White Tiger side with the void space in the middle to gather the Sheng Qi for the whole household. Furniture layout for a living room. The art in Form Feng Shui lies in how to find a balance and a harmonious relationship between the six parts that enclose the void space: what is above, below, front, back, left and right, experienced by a person entering into the setting. If there is “Ganying” or “mutual resonance” between the void space and the occupant, then it is considered to have good Feng Shui. But one needs to bear in mind, the void would not be there without the solid and the “mutual resonance” does not only involve the sight but the full five senses and our heart/mind as well. 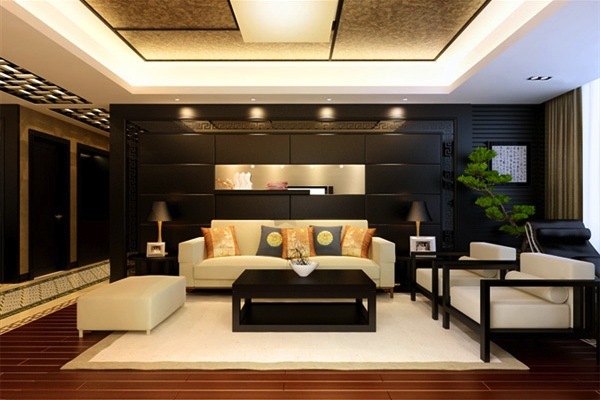 So in this sense, good Feng Shui is always site-specific and personal, the best we can do is to provide some guidelines or “Feng Shui protocols” as preferences rather than as some strict rules. Generally speaking, the regular is preferred over the irregular; to fit in is preferred over to stand out in a situation, being humble is preferred over being ostentatious and being simple and direct is preferred over being complicated and indirect. Anything that is too extreme is always considered undesirable and anything that is too regular and too static (dead) without any “sheng qi” (life enhancing Qi) is also undesirable. The trick is to find a dynamic balance between the Yin and the Yang, so the environment comes alive and we can engage the resultant built form fully in its unique circumstance. It is just that in Feng Shui and Chinese architecture, we put the emphasis in the Yin (the Void) rather than the Yang (the Solid), but it is not to say Yin is better than Yang, but rather the need to harmonize the two (the solid and the void) to be holistic. It is not how “pretty” a building ooks with the tangible that determines the feng shui of a place (the quality of the environment), but how useful and how engaging the intangible aspect of the built form and the natural environment can be, that made the subtle difference. 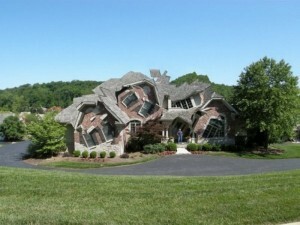 For most of us, this type of weird house is difficult to have an emotional connection to because it looks like an earthquake has struck it and it sits like a sore thumb in the landscape. The type of persons who wants to live in this kind of house often has some sort of psychological issues to start with, so in the long run, the feng shui will not be supportive. 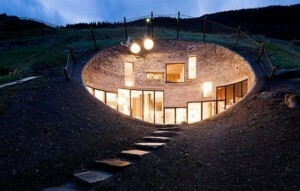 This is also an unusual house as well but it is still considered to have good feng shui, because it is protected by the earth like a bunker and orientated towards the warm sun with a generous “Mingtang” (open void space) at the front. We can clear see and relate to its regular and balanced “face”. At night it will “glow” to make us feel happy that we have arrived home. The first house is mainly concerned with the unusual “look” of the solid form and it stands out in the landscape, whereas the second house mainly deals with the void space at the threshold between the internal and the external, with the house fit neatly into the landscape.